Follow our step-by-step guide to doing roof maintenance safely. While it’s not necessarily wise to get up on your roof, there may be times when you need to make the climb to fix a slipped or broken tile or clean up tree debris, for instance. So here’s a step-by-step guide to make sure it all goes without a hitch. A safety harness may seem over the top,but one slip could have drastic consequences. Even if you’re only up there briefly removing a branch, five minutes spent securing safety is priceless. Step 1: To access a roof, you’ll need an extension ladder. Stay well away from power lines and don’t put ladder across doorways. 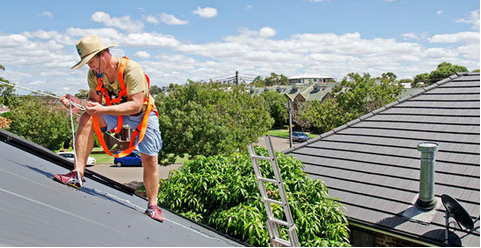 If you’re getting off ladder at top, ensure it is extended 1m higher than gutter or roof. The angle of ladder should be 4 in 1, that is, for every 4m you go up, you come out 1m from gutter line. Always face ladder and keep 3 points of contact with it (both feet and a hand on stile), and don’t overreach. Step 2: When on a roof, you need to wear a harness connected to a securely anchored safety rope. Throw rope with at least 700kg breaking strain right over roof. Step 3: Tie rope to a structural part of house or a tree. (Don’t be tempted to tie it to the car’s tow ball in case someone drives off with you attached!) Use a bowline knot that is strong but easy to undo. Step 4: Ask the supplier at outlet to explain how to put on harness and have it adjusted to fit properly. You put harness on by stepping through leg loops, then place it over your shoulders with D-ring at back. Do up chest buckle. The lanyard, which connects harness to safety rope, is fixed to D-ring and must be at top, centred between your shoulders. Step 5: Climb ladder, reach out and pull on rope so it is taut. Tie an overhand loop or simple loop knot. Step 6: Snap hook of harness into loop. You’re now ready to step onto roof. As far as possible, walk only on line of screws on metal roofs and on front of roof tiles where they are double thickness and supported by a timber batten underneath. Always move slowly and carefully to keep your balance. Don’t allow harness to give you a false sense of security – it’s a last resort only. Step 7: Once on roof, reach further up rope and tie a second loop. Steady yourself, unclip harness from first loop and clip it onto second loop. Continue up roof in this way, making sure you’re stable before unclipping and re-clipping. Don’t pull yourself up by rope – it is just there to save you, if you slip.